Is it Time to Upgrade from Rain Barrels to Tanks? So, you're catching rainwater into barrels, helping the environment, and saving a bit of money on your monthly water bill as an added bonus. Great idea. But when do you make the decision to take the leap, i.e., upgrade to bigger tanks, and maximize on your bounty? And how do you go about it without busting the bank and creating yet another huge project? Illustrated below are two systems that will accomplish this transition with relative ease. Amy, a long-time Santa Fe resident, has two 500-gallon (1,895 liter) tanks that are gravity fed from the roof linked together with PVC connectors to maintain equilibrium in tanks. Both tanks have a standard hose spigots attached to the bottom of it for watering the yard. No pump is necessary. This system is an easy upgrade for anyone with space for a tank next to the house and where a majority of the rainwater falls from the roof in one location. 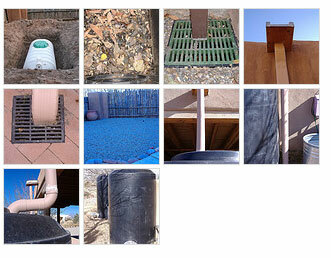 In some cases, it is possible to simply replace the existing rain barrels with larger rainwater catchment tanks. Amy installed two tanks to insure she had enough water for irrigating her one-acre yard. In Santa Fe, where the annual rainfall is about 14 inches (35 centimeters), she rarely runs out of water to irrigate her yard since the tanks were installed. She harvests the rain from only the west side of her house and the garage roof (i.e. about 800 square feet or 75 square meters). She is currently looking into expanding her water catchment to the west side of the house, by replacing two more of her rain barrels with two larger tanks. For most small yards, a single 500-gallon (1,895 liter) tank would probably suffice. Total approximate cost of the current installation is about $900, excluding labor. In some situations, an underground tank is a better option. Deborah has a small yard and a tank would have taken up extremely valuable yard space. So in xeriscaping her yard, she installed underground 4" (10 centimeter) flex pipes that connected to her existing downspouts. Screens installed at the bottom of her downspouts filter out most of the larger debris. The underground pipes slope to the middle of her yard from both sides of her house and are joined with a simple PVC Wye connector. They then enter into the underground 600-gallon (2,650 liter) tank. Installed in her tank is a standard submersible pump that feeds her drip irrigation system. It is wired to a nearby electrical box and she manually plugs it in to turn on the pump to irrigate her yard. Total approximate cost of this installation about $1,000, excluding labor. These two installations demonstrate the simplicity of upgrading from rain barrels to tanks and how to do so cost-effectively. Both systems can be continually upgraded with other electronic conveniences, but for now, both Amy and Deborah are capturing more rainwater, saving money on their monthly water bill, and literally preventing rainwater from going down the drain! Some cities and states offer incentive programs that can be used to offset the costs of the tanks, so be sure to check with your local water company. If your city does offer a program and it is not listed on our site, please send us an email so we can add it to our listing. If your budget doesn't allow for tanks, you can link multiple rain barrels together. This offers expanded storage while not incurring the cost of a larger tank. NC State Leads National Effort To Evaluate Fresh Water Sustainability In The Southern U.S.
1. How do you harvest rainwater? 2. Where do you get the water? 3. What is the best way of harvesting rain? 4. 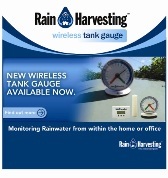 Why should I harvest rainwater? 5. Do I need pumps to harvest rainwater? 6. Can I use drip irrigation or soaker hoses with a rainwater? 7. How big a yard can I water? 8. How big are rain barrels? 9. I want more pressure, how should I raise it? 10. Can I water my grass with rainwater?